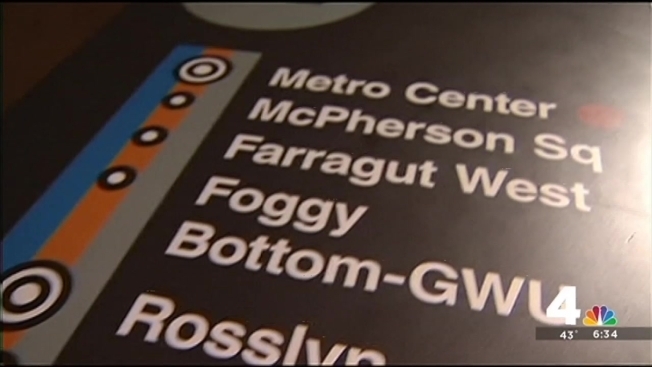 Doors opened on the wrong side of a Metro train at least three times in less than a two-week span, News4 has learned. The incidents in question happened Jan. 30 at the Smithsonian Station and twice on Feb. 9 -- one at Grosvenor and another at Prince George's Plaza, according to Metro. In every incident, the train operator was removed from service and an investigation was opened. "All I can say is that it is happening," said a Metro source with direct knowledge of the wrong door events. According to Metro, the reason why the doors opened on the wrong side varies in each case. At the Smithsonian Station, the incident happened about 10 p.m. A train operator was turning over control of the train to a new operator, Metro said. When the new operator opened a window on the non-platform side of the train, he inadvertently pressed the door button for the wrong side. There were no injuries. In the Feb. 9 incident at Grosvenor, the train operator was attempting to recycle the train's destination signs and accidentally opened the doors on the wrong side. There were no injuries. In the Feb. 9 Prince George's Plaza incident, the operator was trying to isolate a rail car because of a sick passenger. During that process, the operator mistakenly opened all doors to the train. There were no injuries. Aside from safety issues with doors opening on the wrong side of the train, these episodes also create delays. Any time it happens, the train operator is expected to do a full "walk-around" the train to make sure nothing has fallen out. That takes time. News4 obtained an internal Metro memo which is now asking rail supervisors to increase monitoring of trains. Train operators are being reminded to follow the "5-second rule" when they pull into a station. The rule is a requirement that operators pause for a moment before initiating the door open command. The goal is to promote situational awareness and reduce mistakes that come from repetitive behaviors. Metro notes that train operators open doors more than 5.5 million times each month. On a typical workday, the doors open about 245,000 times. "When an action is repeated this frequently, the potential exists for muscle memory to take over and the task to occur without conscious effort," Metro Chief Spokesperson Dan Stessel said.